Let us introduce you to Dr. Brent Reeves, Associate Professor of Management Science and Computer Science, in our first COBA spotlight. I started as a double major in Bible and Accounting at ACU. I took Intermediate and Auditing before realizing I didn’t really like accounting. 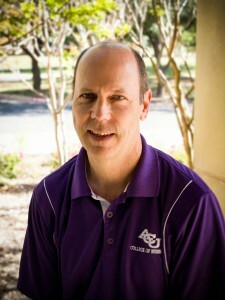 About that time, Dr. Charles Small joined ACU after finishing his Ph.D. at A&M. He said, “Switch majors – it’ll be great.” So, my junior year, 2 weeks into the semester, I dropped 18 hours and added 18 hours. Super stressful time. The schedule change made me reconsider the Bible major so I asked Dr. John T. Willis about the difference between an undergrad Bible degree and a graduate Bible degree. He answered, “When you finish the undergrad degree, you’ll be ready for the questions.” So he had me. My dad offered to pay tuition if I stayed at ACU, so I was fortunate to be able to study under Willis, Olbricht, Fair, Ferguson, etc. Those guys were great. 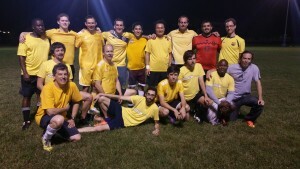 Next came ARCO Oil & Gas in Dallas for 4 years. We had 4 of IBM’s largest mainframes and a Cray-II supercomputer with 300 people in systems and programming. And… we made terrible systems. Every year, they got bigger and more expensive and…not any better. One day I caught an accountant saying, “All I wanted it to do was…” That got me thinking about User Interfaces – what would it mean to have a User Interface that let you do exactly what you wanted to do? And Knowledge-Based Systems – what would it mean if the system knew, understood what you wanted to do? Those two questions led me back to graduate school to study Artificial Intelligence and User Interface Design. In a random coincidence, I resigned the day the Challenger shuttle exploded. After finishing graduate school in Computer Science in1993, teaching spots at the big “R” schools were, interestingly, not all that attractive. Two consulting opportunities arose – one with Software Research Associates, a company headquartered in Tokyo, and the other with ObjecTime, a Nortel-spinoff out of Ottawa. I got to work for ATT, Lucent, Motorola, and Ericsson and work in half a dozen countries. Challenging, but great. What drew you to teaching and working with students? The main draw was for the family lifestyle. You immerse your children in education – what it means to ask hard questions – what it means to work with people who study all kinds of different things they are passionate about. Enabling students who work hard to reach that “Aha” moment is great. What is the best part of working with students? Although the brilliant students are a delight, the best part is the students who just work hard. It is satisfying to see a student reach that point where it finally clicks. Radio-control fixed wing and multi-rotors. Mostly scratch building. But now and then even flying. And by flying, I mean, crashing. I am fortunate to spend lots of time with my boys hiking around and enjoying creation. Terry Pope once humbly acknowledged that he was the best golfer in COBA. In that same spirit of humility, I am undoubtedly the best faculty player on ACU’s world famous intramural team, the Sunflowers of Death. The first day in Management Information Systems (45 students), as I was going through the syllabus, a student came in late and sat on the front row, pretty disruptively. Two minutes later a phone rings and he reaches into his backpack, looks at it, and answers it. “Hello? Yeah. Nah – some class. Whatever. Tonight? Sure.” By that time, I had just stopped talking. By now the whole class is listening in to this conversation. It just so happened that I had brought my grandfather’s hammer to class for an illustration about technology “tools”. So I walked over to the student and said, “Are you done?” “Yeah, why?” “May I please see your phone?” “Uhmmmmm, ok.” I took his phone, placed it on the floor, picked up the hammer and smashed the phone. Surprisingly, it didn’t just explode into bits, so I hit it again. Then I picked up the pieces, handed them to the student and said, “I’m sorry, son, but this class isn’t going to work out for you. You are excused.” He stammered around a bit and left. The room was silent. Blank stares all around. Cell-phone policy explanation complete. I had said, “I’m sorry, son” because he actually was my son. It was Joshua, wearing a cap so students wouldn’t recognize him. When his phone rang, it was because I had speed dialed it without being noticed. When he answered it, he had reached into his backpack, turned off the ringing phone and grabbed a non-working old phone and pretended to have a conversation. The funniest thing of all was that right after I smashed the phone, Joshua was looking around at the students and a guy across from him was holding his own phone and frantically pressing ALL the buttons trying desperately to shut it OFF. Mom. Growing up in a time when the public voices we heard were mostly male, she found a way to be constructive. Tireless worker, always teaching, volunteering, organizing. Dad. Church of Christ preacher who decided to do missionary work in a foreign country. He was extremely well-read. Preached for German-and English-speaking congregations every Sunday for 12 years in Wiesbaden. Dr. John T. Willis. In a graduate class “Advanced Introduction to the Old Testament”, each student gave a presentation on the book they had been assigned. When the Isaiah student started with the same-old same-old, Dr. Willis kindly interrupted, “I see your references don’t include Blinkendorfer. When you’ve had a chance to do a little bit more research, have another go at it.” Boom. I learned there are real issues in the biblical text and we must deal with them. Before you quote scripture, do your homework. Undergrad: Dwight Caughfield. Disciplined, studied, calm, clear approach to topics such as new programming languages. Graduate: John T. Willis. He modeled how to treat scripture with respect, to do your homework – not just quote a 2,000 year old saying because you like its current translation. If you rule out the “clearly ridiculous” powers, I choose… Magneto. Shaping metal would be awesome. Well, either Magneto or the power to type faster. Either one. I’ve gotten to stand on Lost Arrow Spire twice. If you ignore the 3,500 foot drop, it has a nice view. I once learned to memorize a deck of cards so you could shuffle it, read the cards, and I could recite them forwards, backwards and name the 17th card, etc. So why are names so hard to remember? We have a great set of profs here and after 14 years at ACU, I am still continuing to learn to appreciate how much work that takes. It takes much good will and many contributions to make ACU go. I wonder how to live a life that deals intentionally with the challenge to be “Grace and Truth”. What if that is the test? Today, this day, I am not so good at that.